I have created a weight loss chart for my own use since I started fasting in 2006. I have tuned it up a little in order to share with you. If you are searching for good weight charts to support your fasting weight loss program, here is one. To see how successful your fasting weight loss is going, it is important to use a weight chart to keep a visual record of your weight. How to Use the Fasting Weight Loss Chart? 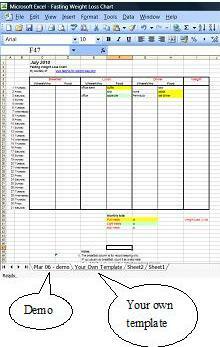 After downloading, you will have an Excel file which contains two worksheets of weight loss charts. One is my demo sheet which is a real record of my first fasting month of March 2006. Click the next worksheet ‘Your Own Template’ and you will be able to modify and duplicate for your future use. For environmental reason and easy filing, I always keep this file in my computer. If you don’t access your computer daily, you can use a print copy and update your computer record from time to time. Get a good scale. It is quite economic to get a good scale for home use. Get on and off it at least three times to see that it gives a consistent reading. Put it on a level, hard surface at home. Don't worry if your scale shows a weight different from other scales…you are only interested in tracking the changes. Weigh at the same time under the same conditions every day. As for myself, I always weigh before swimming. As I usually don’t have food before and after, so my weight should be quite consistent. If you are weighing at home, I would suggest first in the morning after toilet. It doesn’t matter if you weigh lighter at that time of a day. As I said, you are only interested in changes. At the end of each month, you will be able to come up with these important numbers. You won’t necessary get a steady drop in weight. If you have a goal to achieve, be patient, you’ll be there. Remember, you didn't put on extra weight overnight so it is equally unrealistic to take it off quickly. However in the long run, if you are consistently doing exercises and short-term intermittent fasting, you are moving ahead towards your weight loss goal. Regarding myself, I didn’t set a weight loss goal. I was intended to fast for health, but weight loss happened naturally which made me feel like hitting two birds with one stone. The beginning of a weight loss effort is when weight keeping is most fun - a good time to start the habit. At any time, though, your record will show ups and downs because of changes in fluid balance, differences in fluid intake from day to day, level of physical activity, and weight of undigested food. You will learn to understand these variations and use the overall trend to guide your weight control plan. Remember, today’s weight is an important bit of information but not an indication of the success of yesterday’s weight control efforts. Fat weight changes much more slowly than does water weight, so water weight changes will overshadow fat changes on a daily or even weekly basis. Your weight may go down the day after you overeat, or up the day after your diet and exercise were perfect.